Walker Ground Barn015394 36219work Self-cateringThis converted traditional Lakeland stone barn is situated in a picturesque rural location at the end of a small lane and next to the bridle path to Grizedale Forrest. It is only a 5 minute walk into the village of Hawkshead, which is a pleasant walk either down the lane, or across the field and through the churchyard. Hawkshead is a beautiful village of historical interest. It has a small supermarket, newsagents and post office and a section of independent shops. Milk and other local fresh produce can be delivered daily. There are also four Pubs in the village all serving food as well as a selection of cafes. The Barn is comfortably furnished and well equipped to ensure a ‘home from home’ with everything you need to enjoy your self catering experience. The views from the large front bedroom are stunning. There are many walks from the door and direct cycle access to the numerous mountain biking trails in Grizedale Forest. Esthwaite Water offers fishing and there are many interesting places to visit including Tarn Hows, Beatrix Potter’s home Hill Top, Wray Castle and Brantwood. 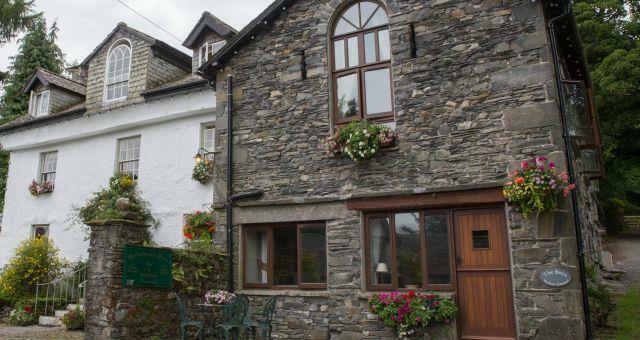 Ambleside, Coniston,Windermere & Bowness are just a short drive or ferry ride away. A great location for exploring the area. Front Entrance opens into an open plan living area. Inner hall with Washing Machine, storage area and staircase to 1st floor. Stairs up to two bedrooms, both having vaulted ceilings with exposed beams. There is also a separate WC and Washbasin on this floor. Pets : We accept a well behaved dog, subject to conditions. Outside: Room to sit outside with garden table and chairs provided, guests may also wonder the B&B garden. Please note; We have a small beck with waterfall running through the B&B garden with fast running water. We also have uneven ground and natural slate paving which can be slippy in certain weather conditions. Care must be taken and Children must be supervised at all times. Parking onsite and Cycle storage. Our Bed & Breakfast is just next door and we will make you welcome on your arrival. Please ask for our Access Statement and ensure you inform us of any special needs you may have prior to making a booking. Sleeps 4 and welcomes 1 well behaved dog. A home from home in the perfect location to explore the area with many walks and cycling paths from the door, with the centre of Hawkshead village being only 5 mins walk away. Walker Ground Barn offers weekly bookings starting on Saturday and short breaks of 3 days starting on any day in some seasons. Please note due to location and nature of the building, Walker Ground Barn is not suitable for guests with limited or restricted mobility. Please ask to see our access statement and please ensure we are aware of any special requirements you may have prior to making a booking. Includes linen & towels, 1 dog accepted. WG Barn offers weekly bookings starting on Saturday and short breaks of 3 days starting on any day in some seasons. The barn was very clean and comfortable, with a beautiful modern bathroom and a well equipped kitchen.It is situated in a peaceful spot just outside the lovely village of Hawkshead, which has several good places to eat.The owners were friendly and welcoming and checked to see if we had everything we needed. 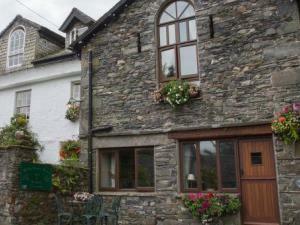 This converted traditional Lakeland stone barn is situated in a picturesque rural location at the end of a small lane and next to the bridle path to Grizedale Forrest. From the main road north of the village turn right into Barnfield. Go through the bungalows keeping left (this is not a dead end ! ), pass along a large stone wall to a small T- junction. Turn right and go to the top of the lane (200 yds.). DO NOT bear left, but go straight ahead on an unmade road and to Walker Ground, the Barn is in front of you and parking is in the B&B car park. From M6 – Exit at junction 36. Take the A 590 to Newby Bridge, pass the small roundabout and take the next right turning signposted Hawkshead & Lakeside. Pass the Swan Hotel on your right and follow the road to the outskirts of Hawkshead, as you arrive into the village take the next left turn. (Signed Ambleside/Coniston) Follow road around the village pass the car park. As the road bends sharply to the right. Go straightforward into Barnfield (signed leading to Vicarage Lane and Walker Ground), then as above. Via Ambleside – Follow A591 through Windermere to Ambleside. There take the A593 Coniston Road, and after 1 mile turn left at Clappersgate onto B5286 sign posted Hawkshead. Follow this for about 4 miles. As you enter Hawkshead the road swings round to the left, at this point turn right into Barnfield (Signed – leading to Vicarage Lane and Walker Ground) then as above. Public Transport – The nearest railway station is at Windermere. There is a regular bus service to Hawkshead via Ambleside (service 505 & 555/556). During high season there is a direct ‘Cross Lakes Shuttle’ bus service, via the ferry, between the railway station and Hawkshead. Walker Ground is about 300 yards from the bus stop in Hawkshead.On foot, from the Co Op in the centre of the village follow the lane up under the arch and up Vicarage Lane to walker Ground.